When you Build and Distribute a LabVIEW application in advanced mode with BLT, you might want to package it into a single installer file. BLT is able to generate this installer for you and will include your application and any required Run-Time Engine, driver or dependency program. You can give this installer file to a new user and it will install your application and everything needed on his machine. •Destination directory: Enter the path of the directory where you want to save your installer file. Your installer will be named "Install Your Product Name.exe"
•Company Name: (optional) Specify here the name of your company. This text will be used to generate the application installation directory on your end-users machine. By default, the installation directory path will be: "WindowsDrive\Company Name\Product Name\" or "WindowDrive\Product Name\" if you don't specify a Company Name. •Desktop Shortcut: Check this box if you want the installer to create a shortcut for your application on the client's computer desktop (all users desktop). •Start Menu Shortcut: Check this box if you want the installer to create a shortcut for your application in the Start Menu (all users start menu). This will optionally use the Company Name field to create a folder hierarchy in the Start Menu for this shortcut. •License Agreement: (optional) Specify a License Agreement file (rtf or txt) that you want to display when someone installs your product. They will have to accept it in order to complete the installation. •Include Run-Time Engine(s): Check this box if you want to include NI Run-Time Engines with your product installer. After your product has installed on the end-user's machine, the Run-Time Engines you've selected will be installed. Click on Select to choose the Run-Time Engine(s) to include. • Publish online: Check this box if you want this installer to be published on the web. This will upload the installer on your Product Updates Server and will generate an HTTP URL that you an give to your customers for downloading the file. 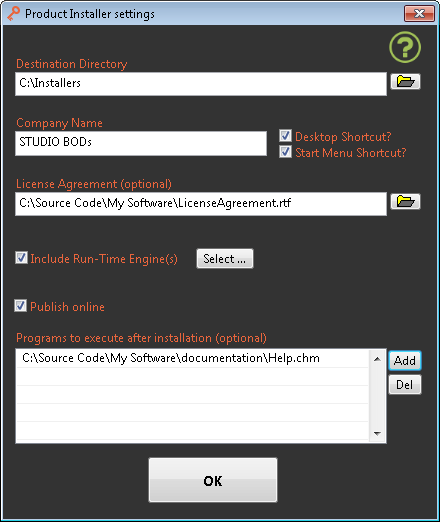 See here how to access your published installers. •Programs to execute after installation: (optional) Click on Add and select a file that you want to execute after your product and Run-Time Engines have installed. You can add multiple files. Click on Del to delete an entry from the list. •Click OK to validate your settings.